I have been asked by a few quilters for videos on techniques and while I am not quite tech savvy enough to produce video I will be making posts. I have also written up some information notes that might help get projects done and I will begin posting those as well. There is a new category for blog posts called Tips and Tricks and I will be putting things there I think. We’ll see how this goes….Please have a look and comment-I appreciate the feedback! 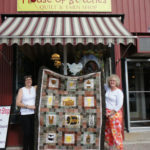 Because of the recent article about you in the Canadian Quilter I have gone to your website. FYI I think there may be a problem regarding your blog posts but perhaps it is because I am using an iPad. I am only able to read the first bit and the part that should open when you click […] does not open. My apologies Fran, I will look into it! Fran, we have done some more work on the web site and hopefully have fixed any issues. I have also created a page for the stained glass tutorial so it is easier to find for anyone looking for information on the technique.